As an administrator in your HubSpot account, you can choose the minimum properties that appear by default for all users in the About section for all records. This will apply to all users in your HubSpot account. However, each user can customize their view of the About section and hence, may have a different order and larger number of properties in the About section. Removing properties in this setting will not remove the properties that were already previously set to appear in the About section for a specific user. To set the properties your users see on contact records, navigate to Contacts & Companies in the left sidebar menu. 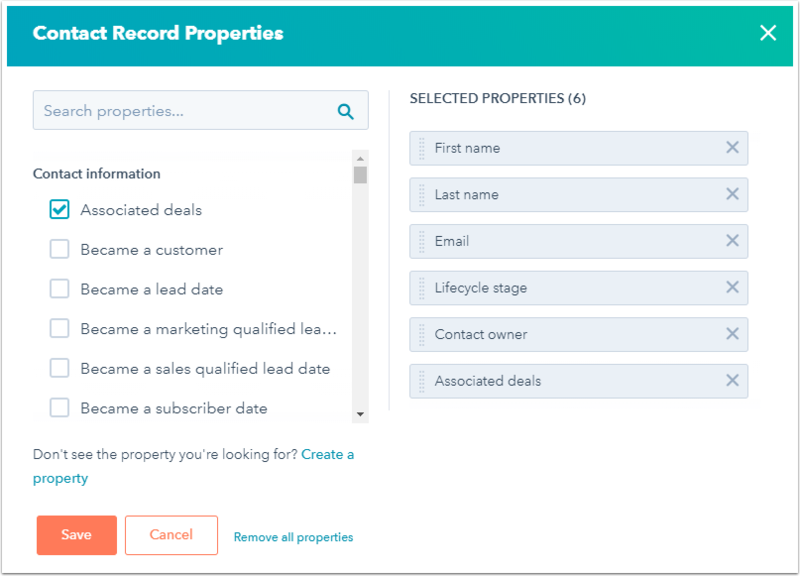 To set the properties your users see on company records, navigate to Contacts & Companies in the left sidebar menu and click the Companies tab. To set the properties your users see on deal records, navigate to Sales > Deals in the left sidebar menu. To set the properties your users see on ticket records (Service Hub), navigate to Service > Tickets in the left sidebar menu. Click Manage to the right of the Set the properties your team sees on [object] records setting. Search or browse for the properties you want your team to see in the About section of this record type, and select the checkboxes to the left to add the properties to the Selected Properties column. Remove default properties from the About section by clicking the X to the right of the property. Please note: if a user has added properties to the About section, the default properties will be added to the existing properties in the About section for that user. The specified default properties will not replace properties that individual users have added. Apart from the default properties set by your administrator, you can add more properties and customize the order of the properties in the About section for your specific account. In the left panel,click View all properties. On the right, locate and hover over the property you want to add to the About section, then click Add to About. On the left, click X to remove the property from the About section. If the X is greyed out, the property is a account-wide default property that cannot be removed. Click and drag properties in the left column to reorder properties in the About section. Please note: if you previously modified the properties displaying on the About card of a contact, company, or deal record, any new default properties added by your administrator will be appended to the bottom of the card. If you only want to see the default properties, you must edit the properties on an individual record.